Working at MeetingPlay, you interact, encounter, and become part of a group of quite diverse individuals. What is great about our group however, is the many opportunities to enrich ourselves, our clients, and the many event technology products that MeetingPlay produces each and every day (like our amazing 3rd generation of mobile event apps). When we paused and thought about what we loved most about working at MeetingPlay, we each shared a brief answer, that we wanted to share with others who may find themselves reading about our team members, our commitment to success, and the culture behind MeetingPlay. 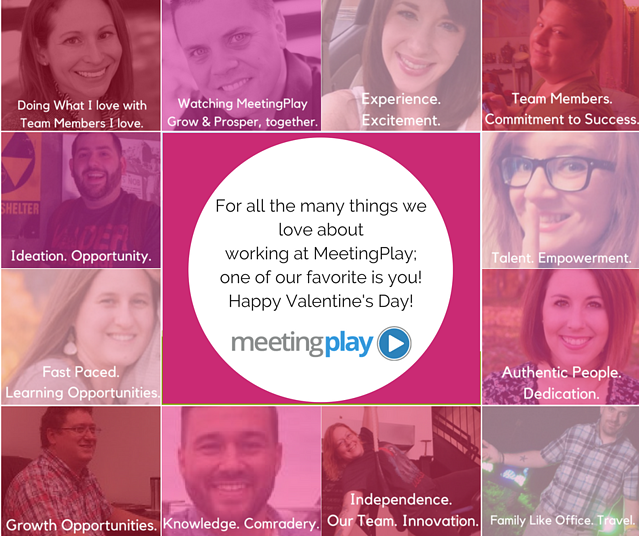 Happy Valentine's Day from MeetingPlay! "Why do you love working at MeetingPlay?"